Internet Network Marketing – Success In Motion! You are here: Home / Internet Network Marketing / Internet Network Marketing – Success In Motion! Recently I was asked Â “ Help! I got a few sign ups but it seems nobody is doing anything.” Ultimately when a person decides they want to start an online business, we can do nothing other than guide them through the steps they need to take to set their success in motion. Most people WON”T do anything that is our nature. We want a lot of things in life, but we hardly ever put forth the effort required to achieve our goals.Â One of my other passions in life is Martial Arts, I got good at it because I sacrificed Time and money. There where many years I felt like just giving up. What I didn’t realize in those years is that every year I sucked it up and continued forward I got 1 step closer to my reality.Â When I decided that I loved Martial Arts I started like most others, I joined a public class of about 30 people. As the years rolled by only 2 people achieved a high level of skill Me and my good friend.Â I would like to think its because I am gifted… But the truth is only me and one other person are left from when I first started 15 years ago. Think about that for a sec, only 2 of us where left standing, everyone else gave up and threw in the towel. I sacrificed $90 a week taking 3 private lessons (on top of public lessons) for 5 years straight.Â YA, I had a job(s) and bills the entire time.Â I found the money and I found the time to do it , because it was something I really wanted to accomplish. Marketing online is really no different from anything else.Â It will require both Money and Time.Â Regardless of how easy someone says something is it will still require you to spend time and moneyÂ doing it. The knowledge of Martial Arts have been passed on for thousands of years.Â They continue to passed on from person to person.Â -> Passing on the knowledge of internet network marketing is the same way. 1 person at a time.Â You will never learn how to do anything from learning from a computer alone. You need to talk to someone who has done this stuff.Â The most critical thing you can do is find 1 person who will help you learn. You think I am kidding it took me over $130,000 to learn what little I know. Knowing someone who knows something will save you money, end of story. The people that join my business and opt not to take responsibility for their own actions, I DROP LIKE A BAD HABIT! There are a lot of people online who actually do know how to market. You just need to find 1 that you can learn from. There is a saying: When the student is ready the teacher will appear. You keep moving forward, you keep providing value, you keep believing in yourself. Only a few people get to the finish line, if you are going to be one of them face the reality that this isn’t for everyone. 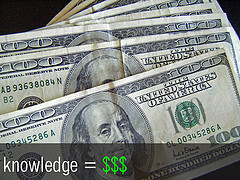 You make money in Martial Arts by being able to pass the knowledge along. In the Internet network Marketing Industry – – – > You make money by being able to pass the knowledge along.